A dreary Monday here in Noraland, but I’m hoping it will be productive. NukuNuku is determined to help out. So how’s Monday going for you? My Monday looks a bit like yours! 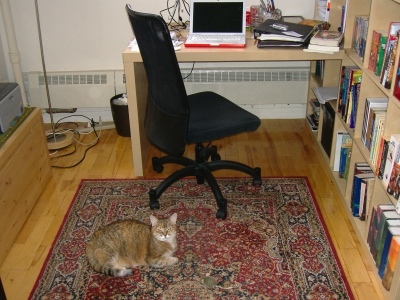 Cat, check; rug, check; laptop, check. Didn’t get so much writing done today because I’m wrestling with a bad job situation and trying to figure out how to proceed. But I DID write. Or at least, plan. And brainstorm. So that was good. Your kitty is too, too cute! Gotta love the tabby markings.